The favorite to win this race will be Healdsburg senior Gabrielle Peterson (Christopher Chung/Press Democrat photo above). She really came into her own during her junior Track and Field season. After qualifying for the state meet in 1600, Peterson narrowly missed making the 3200 with a 4th place finish at the NCS MOC meet. She rolled to her 10:30.95 PR at the Hoka Postal National meet during cross country and will be looking to make a major statement here. Her main competition should come from Granada senior Colleen McCandless who has led her Granada teammates in cross country to unprecedented heights during cross country. San Ramon Valley's Kate Tavella and Oakland Tech's Caroline Garrett should also be in the mix and will roll with the front pack. The King's Academy junior Anna Mokkapati won last year's CCS race while wearing one shoe through most of the race. The wildcard in this field is Carlmont junior Kaimei Gescuk. 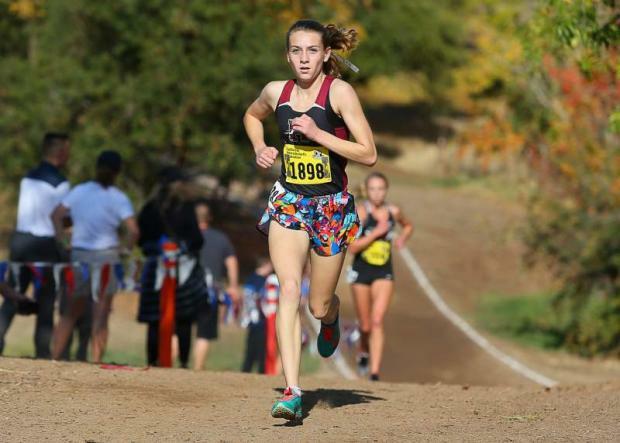 She rolled to a sub 18 minute time at the California state cross country meet's Division I race to finish 10th in the always tough division. She will be trying to match her cross country success here. This event has more than lived up to the hype the past few years and this year will be no different. Last year's state champion in the 3200, Jesuit then sophomore Matt Strangio, finished in 2nd place here as he chased fellow section runner, Collin Ullrich of Liberty Ranch. Liam Anderson finished in 3rd place after running a 1:59.65 personal best in the 800m earlier in the meet. Those two runners will be back here to battle for the first time this season but it will definitely not be the last time they face off this season. Strangio may have the slight edge as he has been running well so far this season and Anderson will be completing his 800/3200 double once again. If you haven't done so already, check out Jeff Parenti's feature on Matt Strangio and one of his early season workouts which you can find at this LINK. The rest of the field will be looking to chase the two talented runners to personal best times. Defending CCS champion Owen MacKenzie had an injury disrupt his senior cross country season and will be looking to post a fast time here. 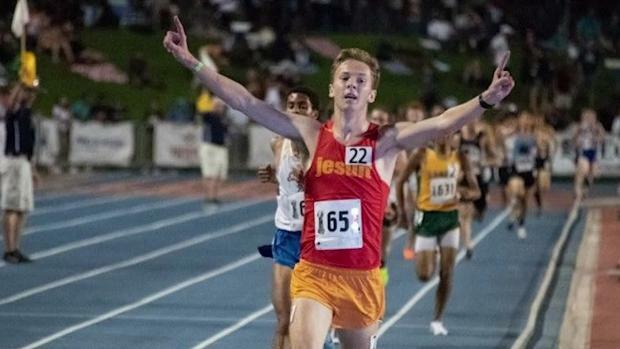 Foothill senior Russell Sullivan was one of the top section runners during the cross country season and will be looking to race his way to Arcadia.